This was a bit of a risk, making a public declaration. I’m just not a methodical, program-following sort of person. I was afraid of embarrassing myself by having to report, about now, that I’d filled out the workbook pages for a week or so and then just let the whole thing fade away. That’s has certainly been the fate of every attempt at journalling I’ve ever made. I was able to stick with the program. I had a rough few weeks at the beginning, when I was using the wrong tools for recording my progress (more about that below). And the last week in this 12-week cycle corresponded with a half-personal/half-business driving trip out of town. I hauled the workbook along with me but didn’t jot so much as a note in it. That’s ok, though, because both segments of that trip were “culminating experiences” for two of the five goals I was working on. I was working the program the whole time, just not using the workbook to do it. Since the important thing is making incremental progress on the goals, I’m perfectly happy to grant myself a bye for recording that week. I’m also giving myself the whole month of September off before I decide whether or not to pick up the program again in October. I’d like to pretend that was just because I’m taking a rare two-week vacation which is also the culminating experience for three of my personal goals. But there’s also the embarrassing fact that I did my arithmetic wrong and thought the first workbook would get me through till the first of October. But it’s a 12-week book, not a 16-week book, and that means it only covers three months, not four. Math majors don’t generally shine at arithmetic but, even for a math major, that’s a pretty dumb mistake. Right now, I’m thinking that when I get back at the start of October, I will return to the program and probably even to using the workbook. I learned a lot from my first pass. Despite the problems I have with the workbook itself and some mistakes I made in goal setting, I think the experience was quite productive. I feel as if both I and my company made real progress this summer and am pleased. When I start each day by writing down my priorities, it really does affect how I choose to spend my time. When working for oneself, especially in the context of a startup, making choices about what to do next feels a lot like throwing darts blindfolded and hoping they stick to some wall, somewhere. 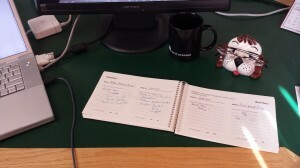 With a written reminder of my priorities sitting right in front of me, I am able, fairly often, to get myself to set aside the next interesting task and focus instead on the next important one. I really am motivated to have something of substance to write down in each column each day. Actions speak louder than lists. I had one product idea / project that kept working its way back into my week, despite it not being one of my stated goals. I had one personal goal for which I almost never made time; that column was empty more often than any other. At the end of three months, it’s clear which should be in the goal list for the next cycle and which should not. It’s not about how much time I spend; it’s about picking the right things to spend time on. Sure, working on my writing is, by definition, labor intensive. But one day, for my productization goal, I had one great 10-minute phone call with just-the-right-person. I jotted it down in the notebook, called it a win for the day, and got on to something else. I wasted a bunch of time using anything-but the workbook itself. I frankly thought that the workbook was a bit dumb and limited (see below) and would be tedious to use. I do not, voluntarily, write things down by hand any more. I thought having to re-write the goals at the top of each column for each day was silly. So I tried to find an automated solution for my recordkeeping. We use Harvest for all our time tracking. It’s great and has become essential to my business. So I created a Personal Development client and added my Zig goals as tasks. But see paragraph three above. Recording your progress on a Zig goal isn’t about hours spent. It’s more binary. It’s more like counting coup; either you’ve earned the right to put a notch on your stick or you haven’t. So I abandoned Harvest. I briefly considered making a Google spreadsheet and just leaving the window open on my machine all day. But I’m having enough trouble with my hands that I really don’t need more windows to click between. So starting Week 4, I opened the workbook up on my desk, jotted my Goals at the tops of the columns for Day 1 and was off to the races. It turns out that writing the goals down each day is a small but important reinforcement. Having the book open where you can see it no matter what screens are open is important. And hand-writing short notes is not THAT tedious; I just live with the fact I can’t always read what I’ve written. Two of my personal goals shared a column. They were the two I had the least success in pursuing and I’ll probably drop both for my next cycle. Maybe I intuitively chose the correct pair to share; they were less important to me and ended up getting less effort. Or did their sharing a column doom them? Probably not, but if I use the workbook for my next cycle, then I’m definitely choosing just four goals so there’s no sharing. I could never figure out how to answer the “Is this enough?” question at the bottom of each column. This may well be related to my original big concern about my goals. They really weren’t very specific and measurable. So there was no good way to measure enough-ness. I was also terrible about doing the week-in-review sections. But then, I thought the questions were not very useful (see below). Only five days per week. I don’t think anyone should work seven days a week. But the Zig goal setting process explicitly encourages setting non-work goals to help you build a well-rounded life. If my goals are supposed to encompass family, friends, hobbies, fitness, and even spiritual growth, what happened to Saturday and Sunday in the workbook? For my fitness goal, it was easy to just jot a weekend bike ride down on Monday but my two other personal goals definitely suffered from the work-day-centric record keeping. The Week in Review questions are primarily negative. There are three sections to write in: Highlights from the last week, What got in the way/What didn’t work, What I learned from what didn’t work. “Highlights” is ok. But why focus on “didn’t: for the other two? Sure, I need to analyze what I did wrong. But I think recording/affirming what I did right is at least as important. For me, anyway. Oh, wait, you want to know how the actual work went, don’t you? Sales are slow but we’ve had a fair amount of success with a promotional campaign where we are placing free copies with volunteer firefighters. The ERG subgoal for understanding more about ebook production fed nicely into my ‘writing habit’ goal. I’ve gotten nine posts up so far under my own byline and Bret contributed three. I think we’ve got enough material for several more posts and I’m pleased with my personal rate of a post every couple of weeks. The ERG didn’t, itself, generate a SaaS product idea but that other project that just kept creeping back into my week, has produced a promising candidate. As for fitness, connectedness, and Spanish? Well, I rode my bike quite a bit and I’m about to head out on a walking tour in Spain with my husband and two dear friends from our college days. I feel ready; I’ll know in a week how much I’ve actually accomplished. I’m off tomorrow for a couple of weeks of pure vacation. No work, no keyboards. But certainly a chance to reflect and think about the big picture. When I get back, I expect I will establish a new set of Zig goals. And I’ll probably open up a fresh workbook on a Monday early in October and just start writing my goals at the top of each column. I can see how I could generate a different format with seven days and some modified Week In Review questions that might, eventually, work better for me. But I think I’ll work the Zig/Seth program, using the notebook, for at least one more cycle with just a few tweaks: set four workweek goals, try hard to make them more specific and measurable, and try harder to get myself to actually do the week-in-review step even as I pay a bit less attention to the labels on the page.